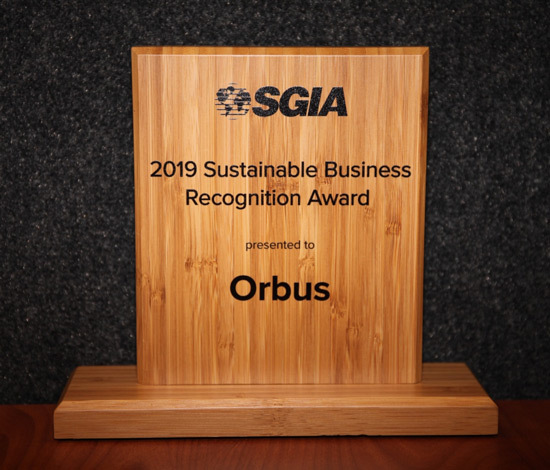 Woodridge, IL – April 1, 2019: Orbus Exhibit & Display Group®, one of North America’s leading wholesale suppliers and manufacturers of display, exhibit, graphic and event solutions is thrilled to announce it has been recognized for Specialty Graphics Imaging Associations’ (SGIA) 2019 Sustainable Business Award. The Sustainable Business Award spotlights companies that have implemented projects to improve employee safety and health, reduce environmental impact, or improved business efficiency. Orbus was recognized specifically for its reduced environmental impact.